Could Snow White Possibly Be Replaced? It is no great secret that May 31st, 2012 was a very bittersweet night for my family. After a decade of visits, and 3,500 rides, my son had to say goodbye forever to Snow White's Scary Adventures. During the months that followed, the one possible ray of light was that there would be a new Little Mermaid ride opening by the end of the year and based on watching the videos from the California version it seemed like something that Ben would love. Unfortunately there was no way to really explain to him that it was coming, and so every visit to the Magic Kingdom for the next four months became primarily a depressing visit to The Graveyard of Snow White's Scary Adventures. If you read my post from last week then you will know that Ben has been having some significant GI issues recently. In order to resolve the immediate blockage we had to place him on significant doses of Miralax, taken every thirty minutes with 6-8 ounces of Gatorade. Over the course of six hours he would receive nearly a month's recommended dosage of Miralax, drink literally a gallon of Gatorade, and then take a couple Dulcolax to boot. Needless to say, he was spending some real quality time in the bathroom (which to be perfectly honest, suited him just fine -- he sat there with his iPad looking at pictures and videos without a care in the world). From Wednesday through Friday this regimen continued, and his mom stayed home with him all day taking care of him and monitoring his progress. By Saturday there was still no clear evidence that the blockage had been resolved, and yet Ben looked and behaved far better than he had been in weeks. Sometime early on Saturday morning I heard that New Fantasyland was actually soft-open to all park guests, and that Journey of the Little Mermaid (JotLM) was actually up and running. A lengthy conversation followed between Ben's mom and myself, and we arrived at the conclusion that getting out and walking around would probably help things along from a GI perspective. I specifically dressed him in dark shorts to help minimize any embarrassment for Ben should he have an accident, I packed a spare change of clothes and some other supplies, and we headed off to the Magic Kingdom. With any luck our months of waiting were over. We arrived at the park and I mapped out my battle plan for keeping the medicine and liquids coming at the proper interval while ensuring that Ben made a bathroom stop at least once per hour. Ben made a brief side trip through the shops on Main Street, and then we were headed back to Fantasyland. My first pleasant surprise as we walked into the Carousel courtyard was to see that the construction barriers had come down from around the rest of the new castle walls. For the first time in seemingly forever the core of Fantasyland was wide open and free of construction, and I have to say it really looks spectacular. We walked through the stone arches and into the new Enchanted Forest, and Ben began to get a little bit interested. As we worked our way past Belle's village and over into the domain of Prince Eric, we were disappointed to find that JotLM was currently down for some kind of repairs or adjustments. 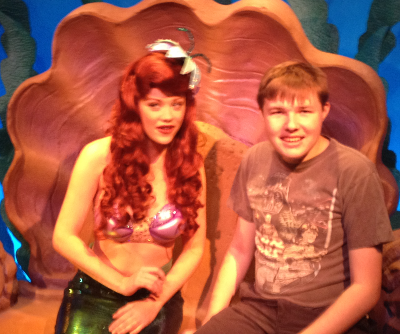 Of course Ben had no idea what he was missing, and so he was perfectly happy to let me take him to the new Ariel's Grotto instead where he got to actually sit down and visit with Ariel herself. By the time we finished there I was starting to run low on my supply of Gatorade, so we made a trip over to Tomorrow land to resupply at Mickey's Star Traders and then to take a leisurely ride on the Tomorrowland Transit Authority. By the time we completed that (plus a visit to the restroom), nearly an hour had passed and we meandered back over to New Fantasyland. As we approached the entrance I could see that guests were entering the queue and that the ride was apparently back up and running. The moment of truth at last! Ben was very patient as I led him through the line. He liked all of the water features, and thought some of the sculptures were cool, but he was completely clueless as to what was about to happen. Then we came around the turn and he saw for the very first time the huge mural on the wall behind the loading station. A tiny smile crept onto his face, as he seemed to tumble to what he was actually visiting. Quickly enough we were loaded into our clamshell, and we drifted past Scuttle giving his intro spiel. He took me by the hand and let me straight back to the ride entrance for a second trip, and for the first time in over four months I finally felt like he had his park back. It might not truly be his Happy Place, but in a lot of ways I think JotLM offers a very welcome evolution. First of all the ride itself is twice as long as SWSA, and secondly the nature of the entrance and exit means that it is impossible for him to simply do laps on the ride. Where it was possible to do 3 laps around SWSA in under ten minutes, it would take the better part of a half hour to accomplish the same thing on JotLM. Because of that, it will be very difficult for this new ride to become as obsessive as his old one. He can go and enjoy it, maybe even twice in a row, but there will be enough space between rides to help keep him out of that mental feedback loop that can keep him so strongly attached. All total we went on JotLM four times that day, and Ben seemed completely happy and satiated with that amount. I think we spent perhaps four hours in the park, all of which he thoroughly enjoyed and at no point did his GI issues cause any accidents. It was a perfect day in the park, and a huge relief. Regarding his GI issues, he continued on that regimen for another day and then on Monday he had a new abdominal x-ray that apparently shows that his blockage has been completely removed. At least, that is what the radiologist's report says. His primary GI was going to review the images himself today so that he could verify the results, and we expect to hear back from him tomorrow. Ben has had a very good week at school so far, and has been accident free and in good spirit. We will be meeting with the GI doc soon to discuss a long term battle plan for keeping this from happening again, but it seems that the immediate issue is resolved. Sounds like a successful day all around. JotLM may be the trick...at least until the Mine Ride opens. Thanks for the update Ron.